The information society or the telecommunications revolution in Korea is only half complete. 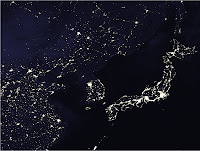 There has been no such revolution or transformation in North Korea, which explains why the satellite photo here has been so widely circulated. It is a powerful and iconic symbol that instantly conveys the problem of national division.